So; any truth to this or are "they" just trying to upgrade us to bigger amps? As long as you aren't clipping SS amps, it isn't a problem. As long as the power is Linear, can it hurt ? If you've got a voice coil capable of dissipating 10 watts and you only put 1 watt in it won't care if its a sinewave or a squarewave. You may not like how it sounds but a watt is a watt. gets driven into clipping while trying to achieve greater output. an output that would satisfy most without worrying about clipping the amp. 200 seat auditorium with a 2800 sq ft room, that would be a room approx. 60ft x 46ft. "Headroom" is always nice to have, but with our speakers we do not need a ton of that for any sane listening levels. 1 watt will make 105db output, 2 watts will make 108db, 4 watts will make 111 db, 8 watts will make 114db... etc. 105db is pretty loud, at least to my ears. Yeah; never heard any clipping with my 52W/ch Marantz on these 904, 800W speakers But; the 350W/ch Crown K1 seems (???) to give a "tighter" response. I use 3.5 watt amps for my LaScalas and Heresy IIs. Not all pro amps are the same, your right some are terrible (noisy) for home use with really sensitive speakers and some are as good, I used the Crown D-75 for years until old age got to one of them. With horns that were way over 110db@ 1 watt and dead quiet and a nice sound. The only thing I ever blew up was a pair of 300 watt subwoofers by sending them 400 watts each. Cost me 4 new drivers. But the common tale is a clipped small amp can overheat and kill a voicecoil faster than an unclipped amp many times larger. Okay, just to be clear, I am not talking about tube amps. I have never heard of a tube amp clipping. I am talking about low power solid state receivers or amps. There have been plenty of times I have seen under-powered receivers trying to push speakers to loud listening levels where distortion is audibly discernible. If not immediately turned down you risk clipping your amp and usually the result is fried tweeters. ... But the common tale is a clipped small amp can overheat and kill a voicecoil faster than an unclipped amp many times larger. This is what most people say, and I'm guessing it is correct. There is one individual on this forum (I forget who) who says it can be demonstrated that it is not true. @Emile, how big is your room? In my 4,000 + cu. ft. room at 13 feet it takes only about 8 watts to produce 107 dB continuous with one Klipschorn, which is rated at the same 105 dB/2.83v/1m as your speakers, BUT the Khorn needs to be in a room corner (1/8 space) to produce that, and yours gets rated at 105 dB with just 1/2 space, so it doesn't need as much power. With that Crown you have a huge amount of headroom. Just don't let irresponsible people near your volume control (lock it behind Lexan at parties, with plenty of ventilation), don't insert or pull out a RCA plug with the power on, and don't rewind or fast forward tape with the power on, especially on a vintage reel to reel, etc., etc. Before I went to an all active setup I used a Korneff 45 amp on my khorns for years never hurt anything, and that amp only puts out 2 wpc max on it's best day!!! Clipping is when the gain at the peak or trough of a waveform reaches the supply voltage. Happens all the same tubes or sand. There's more to it but in a nutshell the two "handle" it differently in that a transformer won't pass DC thru to the load but sand will. Here is some info from two folks on the forum I respect.Unfortunately, Dennis has passed away. It's not the clipping per se that damages the speaker, but the clipping frequently causes amplifier stability issues in the feedback loop that can cause damage (excessive cone motion from infrasonics). Tweeters burn up from excessive long term average power, not clipping. "If your getting distortion or clipping, yes that is very bad for your speakers." Two things ruin speakers, too much long-term average power, and mechanical damage from over-excursion. Unless the distortion or clipping cause either of the above two, your speakers will not be harmed. previous explanations as to why this is a myth. Amplifier clipping causes no damage what so ever, unless you exceed the long term average power limit of the driver, or it causes mechanical damage. Clipping below 40mS in duration is generally inaudible to the average person. The APT Model 1 had an indicator labled 'distortion alert', it would flash if the duration of the clipping was in excess of 40mS. A Peavey with DDT (distortion detecting) will go into limiting when the duration of the clipping exceeds 100mS. The Dynaco Dynaguard had a delay that was dependent on the overdrive applied, but would allow clipping for tens of mS before pulling back the average power leve (user programable). I believe clipping gets blamed because clipping is so often involved, but the real problem is the average power levels are too high. A clipped amp will be putting out a lot of average power, something like a compressed track. Add the HF required to create (created by) that square topped clipped off wave and the tweeter gets a double shot of energy. Van Halen's "Runnin' With The Devil" has a square wave generator applied to the guitar. This was my first clue that a clipped amp sounded worse than it was damaging. Square waves are found often enough in music that a speaker should be able to tolerate them. "I am interested from the academic point of view. Also i might require to make for 2" compression driver. This will also increase my knowledge about the subject. " "I am also waiting 4 ur details/new thread about the klipsch protection circuit"
OK, let's keep on with it here for a while. Clipping will not hurt anything if it does not cause the above problems. After larger amplifiers (above 50W) became common, problems with high frequency units self-destructing became a problem. A tweeter like the EV T35/Klipsch K77 could handle 5W continuous, 50W for 10mS peaks, so normal program material wasn't the problem. The tweeters were dieing from mechanical failure. The voice-coil was wound with aluminum wire that ran out to the terminals on the frame (self-termination). Shallow slopes in typical crossovers (6dB) combined with higher drive levels produced failures. Copper wire was tried instad of aluminum (aluminum work-hardens in a very short time). 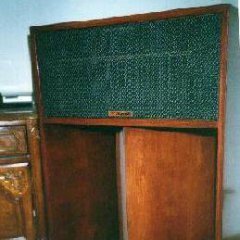 Klipsch switched to the 18dB crossovers in the very early 70s. This helped with the excursion failures. Now, 100W+ amplifiers became common. Klipsch went to cathode-to-cathode connected zener diodes. These clipped off the peaks that were mechanically destroying the tweeters. Things went well for about ten years. In the early 80s it was time to try and get rid of the expensive band-aid (the zener diodes). EV changed the lead-out wire from the self-terminated copper voice-coil wire to a flat BeCu wire like used on expensive JBL and Altec type compression drivers. A new network was designed with an elliptical filter with 50dB of attenuation only a half-octave away from the crossover point. A fast- acting instrumentation fuse was added. The new version of the tweeter used a UV cure adhesive vs the old thermo-set adhesive. After the fuses blew from modern program material (about the same time as the introduction of the CD), they got replaced with fast-blow types (which offered reduced protection). The special instrumentation types were very expensive, and very hard to find. The new UV cure adhesive got soft, bubbled, and failed quite easily. A PolySwitch was tried. Too slow. The old thermo-set adhesive came back. The combination of the super-steep crossover, the flat BeCu lead-out wire, and the PolySwitch seemed to work (with the old adhesive). The zener diodes were retired for mainly two reasons: cost, and limited dynamic range. The AA networks used a pair of 5.1V 10W zeners. These only allowed about 2W RMS through before they started clipping off the peaks (a 4W peak square-wave) . With the advent of digital program material, 2W of undistorted program material no longer seemed adequate (about 97dB at 10 foot). The zeners limited the maximum distorted output to about 100dB at 10 foot. Removal of the zeners allowed exploitation of the 50W/10mS rating of the tweeter, about 14dB more output capability (referenced to the 2W RMS zener clamp). What did EV do for products sold under their brand? The STR tweeter protector was developed for this use. Later it was modified by adding a lightbulb in parallel with the relay contacts. I hope this give a little insight into what is needed for tweeter protection, and how we got to where we are. Vifa, Dynaudio, and others offer a choice between self-terminated tweeter lead-outs and a braided (or tinsel) type lead-out. The difference in cost for the braided type is worth it in my book. Most manufacturers of lower-priced product do not spend the money for this, or better crossovers either (although I am seeing lighbulbs and/or PolySwitches in some inexpensive product). Crossovers and tweeters must be designed to avoid mechanical damage in normal use (correct slope, frequency, and lead-out wire for the intended use). Long-term thermal protection is worthwhile. Some sort of switch device (relay, PolySwitch, fuse) in conjuction with a lightbulb seems to be the most cost-effective. Due to the long time constant of lightbulbs, most use does not seem to demand the switch (which shorts out the lightbulb in normal use). For 1" coils (tweeters), about 1A. The 561 or 211-2 automotive lamp has worked well in this application. For 1-3/4" coils (1" compression drivers), about 2A. The 1156 type automotive lamp has worked well in this application. For 3" (kapton) to 4" (nomex) coils (2" throat 16 ohm compression drivers), about 2A. I have found a 1.5A AGC (or 3AG) type fast-blow fuse will pass 400W of program material in normal use, and blow almost instantly if bad feedback is encountered. A pair of 1156 automotive lamps wired in series with each other, and then wired in parallel with the fuse will allow the show to go on when the fuse blows, and still offer some protection. If the fuse blows in the course of normal use, you need additional HF drivers, horns, and amplifiers. "As for using a L pad attenuator the idea of this is to maintain the same Resistance - Impedance as the Driver ie 8R0 to allow the crossover components to correctly filter the frequency. So how does this increase the loading? " It would seem obvious that the size of the lightbulb would need to be changed for every different attenuation value (if it's to be of any use). "So a 500W amplifier will deliver over 700W power to the driver if clipped hard enough." Really? Power goes with the square of the voltage, so it goes from 500W to 1KW, but that has little or nothing to do with why the drivers blow. Clipping can damage speakers, but not for the 'urban legend' reasons. (at left). Fourier analysis shows the harmonic structure. tweeter) is less than two watts (0.83 + 0.589 = 1.419W). blow out, even under square wave conditions. Yet it does. It takes a lot more than this to cause major failure. " Consider a worst case situation, an amplifier overdriven by 10dB or so. The bass content of the program material causes the amp to clip, the excess HF content from clipping harmonics fed to the tweeter is trivial. However, the average level fed to the speaker at mid and high frequencies is elevated as much as 10dB (due to the input overdrive) during non-clipped passages. It's not the clipping per se, but the poor design of the amplifier causing this. The pole in the feedback loop is generally poorly chosen and lower in frequency than the input pole, and above the power supply/load pole, so the poorly designed amplifier pumps out rail-to-rail signals at the feedback pole every power supply time constant. Good design reduces or eliminates this problem (although it seems like 99% of amplifiers have this problem). The easiest way to fix this is to change the poles so the feedback pole is at a higher frequency than the power supply pole, and the input pole is higher than the feedback pole. It also helps to put clamp diodes across the feedback cap. Another way to fix this is to put an input clipper on the amplifier. NAD amplifiers have this kind of a circuit (they call it 'soft clipping') and it tracks the supply voltages so you get the maximum power the amplifier is capable of. Since the input clips before the feedback loop clips, it's always stable. I used to put 50W NAD amplifiers in clubs with four Klipsch Heresy on them, you wouldn't believe how loud this combo will play driven a few dB into clipping. "2) Many crossovers barely handle the rated power of a speaker system, let alone the effect of a clipping amplifier. When inductors saturate, the tweeter gets not only the normal signal at high power, plus the distortion products from the clipping, but also back EMF from the saturating inductors and signals below the normal crossover frequency because the filter system in overload." Only the cheapest of speakers use low quality parts these days. Back-in-the-day a network needed the tweeter cap replaced (if it was an electrolytic) or the tweeter inductor (if the tweeter cap was a film type) after the tweeter burned out and the operator continued to play the system. In 30 years I can pretty much count on one hand the woofer inductors that failed in hi-fi use, these all developed shorted turns (causing damaging infrasonic woofer excursions). In pro sound I saw quite a few woofer inductors fail from too high of a DC resistance (causing the insulation to burn off the wire and the inductor to short out). The last KW is the most important, how it behaves at the limit. A well behaved amplifier with no dynamic off-set when driven 6dB into clipping sounds much better than a wimp amp with a built in limiter, even if it is twice the rated power. If you have a throw away pair or speakers, try it for yourself. I have intentionally done this with a couple buddies when they made the same argument. Those tweeters didn't last long.... But what do I know.